Start examining the inguinal region by identifying the external oblique aponeurosis which forms the anterior boundary to the canal. In the first image, identify the external abdominal oblique muscle EAO and its aponeurosis. Notice that the lower margin of the external oblique forms the inguinal ligament IL. There is a weakness in the aponeurosis of the external oblique called the superficial inguinal ring SIR and is shown as a white dotted line. The superficial ring has a medial crus (or superior)MC and a lateral crus (or inferior)LC. Passing through the superficial ring are the spermatic cord SC and the ilioinguinal nerve IIN which is a branch of L1 nerve. In the second image, the external oblique has been removed and you see the internal abdominal oblique IAO. 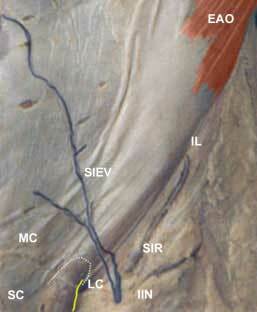 Notice the cut margin of the external oblique at the inguinal ligament IL. Note that some of the fibers of the internal oblique continue down and around the spermatic cord to become the creamasteric layer of the spermatic cord. These muscle fibers perform an important reflex called the cremasteric reflex, a test performed in most routine physical exams in males. In the third image, the internal oblique has been removed and you see the transversus abdominis muscle TA. 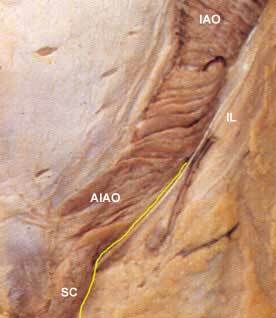 If you look just below the lower fibers of the tranversus abdominis you will see the spermatic cord SC as it passes through the deep inguinal ring DIR. Identify the ilioinguinal nerve as it runs deep to the inguinal ligament. Notice that it does not enter the inguinal canal along with the spermatic cord. The deep inguinal ring is nothing more than a thickening of the transversalis fascia at the point where the structures that make up the spermatic cord converge. A reflex is a reaction to some kind of stimulus (stroke, pin prick, etc.). A stimulus is picked up by sensory (afferent) nerves and carried to the spinal cord (central nervous system) where it forms a synapse with motor (efferent) neurons that pass out to a muscle to perform an action. In the case of the cremasteric reflex, the afferent limb of the reflex is by way of the genitofemoral nerve and the efferent limb is by way genitofemoral fibers to the cremasteric muscle. The result is that by stroking the skin on the medial side of the thigh next to the scrotum, the scrotum is pulled up on that side. The spinal cord segments involved are L1 - L2. Three layers of the spermatic cord are picked up from three layers of the abdominal wall: 1)internal spermatic fascia, 2)cremaster muscle and fascia, and 3)external spermatic fascia. 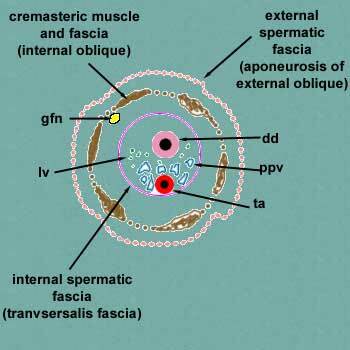 As the structures within the spermatic cord pass through the transversalis fascia they pick up one of the layers of the spermatic cord, the internal spermatic fascia. As it continues through the canal, it picks up the cremasteric layer of muscle and fascia from the internal oblique muscle and finally, when it passes through the superficial ring, it picks up an external spermatic fascia layer, derived from the aponeurosis of the external oblique. Surgeons utilize their knowledge of these layers in the repair of inguinal hernias. Notice the conjoined tendon (or falx inguinalis) X superior to and behind the spermatic cord SC. 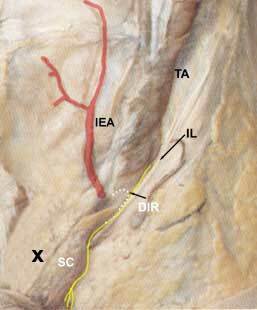 As a final exercise, you should learn the walls of the inguinal canal. most medially there is not wall but instead there is a deficiency called the superficial inguinal ring. superior -- arching fibers of the internal oblique and sometimes transverse abdominis. These fibers start anterior and lateral, pass over the spermatic cord and the medially forms part of the posterior wall of the canal. posterior -- lateral the posterior wall is deficient at the deep inguinal ring. Medially the posterior wall is made up of the fused aponeuroses of the internal oblique and transverse abdominis, called the conjoined tendon X.
inferior (or floor) -- inguinal ligament. Medially, some of the fibers of the inguinal ligament curve under the spermatic cord and fasten into the pectineal line of the pubis, this is the lacunar ligament which forms part of the floor of the inguinal canal. Once you know where the inguinal region is and what makes up its boundaries and contents, you might want to know what inguinal hernias are. A hernia is a protrusion of part of the intestinal tract, greater omentum or just fat through a weakened part of the abdominal wall. In our case, we are talking about a weakness in the inguinal region of the abdominal wall. There are two weakened parts of the lower abdominal wall in the inguinal region: 1)at the deep inguinal ring and 2)at the conjoined tendon. There are two types of inguinal hernias: 1)indirect and 2)direct. When a hernia occurs at the deep inguinal ring, it is called an indirect inguinal hernia. This type of hernia will carry all the same layers as the spermatic cord and if foreceful enough will end showing through the superficial inguinal ring. This type of hernia is definitively diagnosed at surgery by being lateral to the inferior epigastric artery. When a hernia occurs at the conjoined tendon, it is called a direct inguinal hernia. If the force and weakness is great enough, the herniated material will also appear through the superficial ring, but it will not carry all of the layers that the spermatic cord has. At surgery it is definitively diagnosed as direct by being medial to the inferior epigastric artery. After the spermatic cord traverses the inguinal canal, it leads into the scrotum and to the testes. In order to free the testes and its coverings from the scrotum, the remains of the embryonic gubernaculum testis has to be cut. At this point the testes can be withdrawn from the scrotum. What you see is the outer side of a closed sac called the tunica vaginalis. This must be cut in order to view the parts of the testis. The anterior border of the testis is to your right. pampiniform plexus of veins ppv. These veins will become the testicular vein. The anterior surface of the spermatic cord is toward the top. During physical examination, the ductus deferens can be felt as a rope-like cord. Surgeons who perform vasectomies can roll the spermatic cord over the pubic bone so that they know exactly where make their incisions.